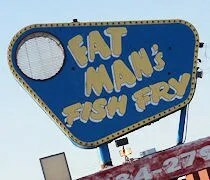 It’s hard to pass up a restaurant that has the word’s “Fat Man’s” in it. Then throw in the word “Fry,” man, this place already sounds like my kind of joint. 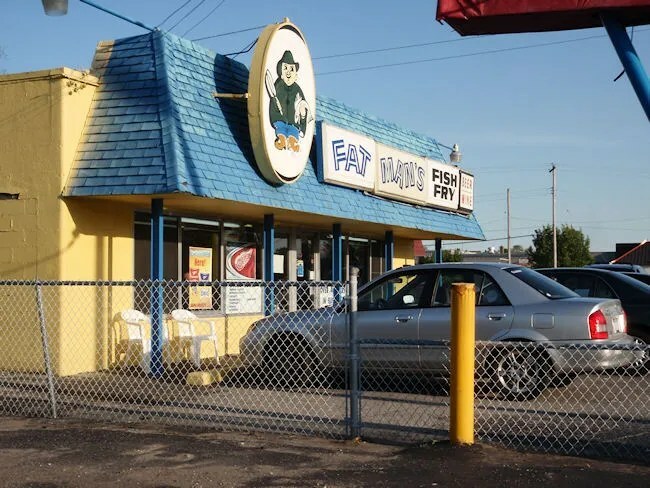 Fat Man’s Fish Fry is on South Division Avenue a few blocks north of 44th Avenue Street on Grand Rapids southeast side. It’s hard to miss as your driving by. A bright yellow building with a blue awning and the magical word (fry) in big letters. I’ve driven by this place many times without time to stop. When my dinner break came around Friday night, I decided it was finally time to check this place out. I was a little surprised to pull in just before 7:00 on a Saturday night and not see anyone else in the parking lot. Even more of a surprise, there was no one inside. I was actually wondering if the place was open, if they forgot to lock up, or if there was something really, really wrong. I stuck around for about ten minutes wondering if I should venture back in the kitchen to make sure there was nothing going on. I finally saw someone walk in front of the building. He looked in the window and saw me and came in apologizing. I’m not really sure where he was, but he was very apologetic about making me wait. I was just relieved that they were open. The menu consists of all sort of fried goodies. It’s mostly chicken and fish, but there are some exotic things on the menu…like fried alligator. The fish is kind of a “You Buy. We Fry” type of thing. You can buy it and take it home like you’re at a deli or you can have them fry it up for you. I don’t really like fish, so I stuck to the chicken part of the menu. I was leaning towards the wings, but decided on the Wing Ding meal instead. 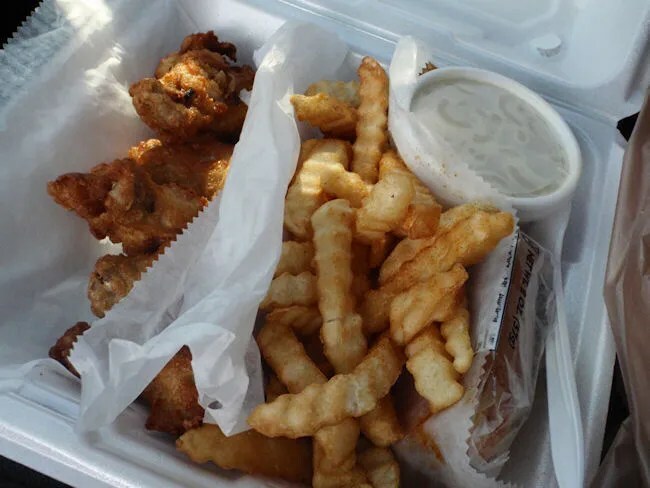 The six wing pieces come dredged, breaded and fried with choice of seasoning. It also comes with fries, choice of cole slaw or pasta salad, and cornbread. The wings and fries were dropped in to the fryer while I waited. The space is really spacious, but there are no tables. There are a couple rows of chairs to hang out while you wait facing the giant coolers with all sorts of drinks. There’s also a small dry goods for sale like hot sauces and the like. Less than ten minutes after placing my order, my name was called. My bill was just a little over $8 which didn’t include a drink. The fries were the first things to go. I couldn’t wait to get back to work before popping the Styrofoam open. The fries were typical crinkle cuts. I didn’t notice at the time, but they have Brew City Fries as an option, but for an extra charge with the meals. I would have gladly paid a little extra for those. The fries didn’t last long, but I had to wait to get back to a table to get in to the wings. They were super crunchy and just a little greasy. As far as Wing Dings go, they were a little on the small side, but they were tasty. The corn bread came in a wrapper so I didn’t even bother. The pasta side was alright, but I really wasn’t in the mood. What I really wanted was fried food. As the name sort of gives away, you’re not going to get a salad at Fat Man’s Fish Fry. 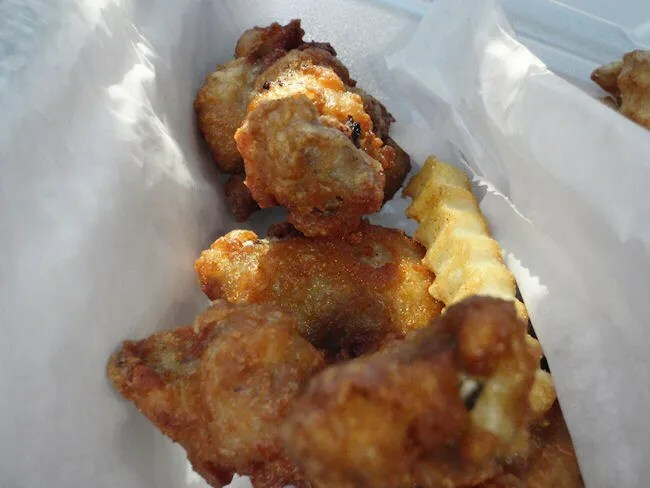 What you are going to get is some pretty solid fried food…and isn’t that what we all want anyway? Oh man, we have to visit… Great review.